In this post from our pediatricians, learn essential car safety for kids to prevent accidents in and around cars. See our resource on PA car seat laws to learn how to protect kids from traffic-related accidents. When it comes to talking about the safety of our children around cars, discussion naturally sways to the newest car seat recommendations, booster seat requirements and child placement in the vehicle. This is all obviously important in case of an accident. What may not be discussed often enough is how we can keep our kids safe in and around a vehicle when there is not even another vehicle involved. According to KidsandCars.org, a nonprofit formed to protect children in and around motor vehicles, 2,200 children are injured or killed in non-traffic events every week! Potential dangers include back overs, front overs, trunk entrapment and heatstroke just to name a few. These accidents occur more than we could even imagine, and we must make ourselves as parents and caregivers aware so these tragedies may be prevented. In the U.S., 50 children are backed over every week because a driver could not see them. On average, between back overs and front overs, 630 fatalities and 30,000 injuries occur every year. Most of these take place in driveways and parking lots and in over 70% of the incidents, a parent or close relative is the driver behind the wheel. The age of the victim is most commonly 12-23 months with children younger than 5 years at most risk. While back overs and front overs can occur with any vehicle, over 80 percent of front over incidents involve a larger-sized vehicle. We must remember that toddlers and young children are unpredictable. They have no concept of personal safety. Front overs are often the consequence of a child following a parent into the driveway without their knowledge. Thanks to KidsandCars.org, all vehicles sold or leased in the US today have back up cameras installed in their vehicles. You do not have to wait however to purchase a new vehicle in order to have one; rearview cameras/sensors can be installed on any vehicle. Just because you may have a camera, however, should not make you feel completely certain that a child cannot come into the path of your vehicle. 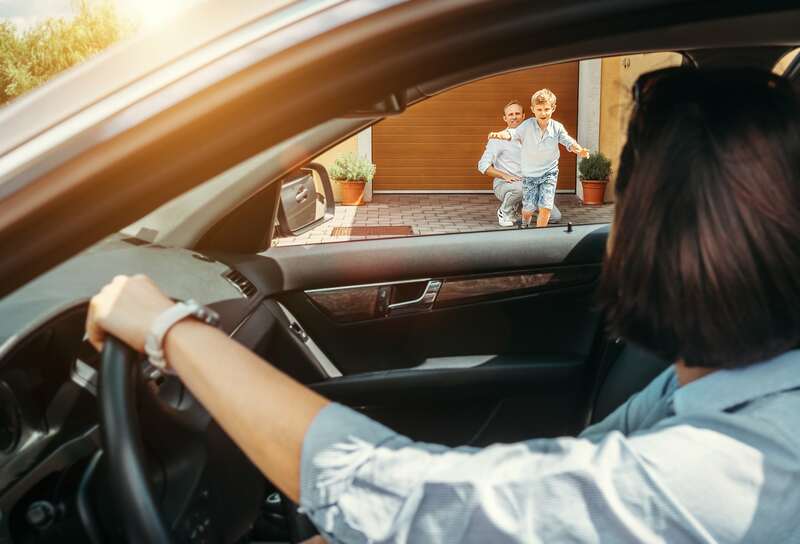 It’s always best to look around completely before getting into the vehicle, move forward slowly and pay attention to children who may run into your path. Always walk around and behind a vehicle prior to moving it. Know where your children are and make sure they are in your sight and supervised by another adult before moving the car. Install a rearview camera, backup sensors and/or additional mirrors on your vehicles. Make sure children hold hands with an adult in parking lots at all times. Teach your children never to play in, around or behind a vehicle. Be aware that steep inclines and large SUV’s, vans and trucks can add to the difficulty of seeing behind a vehicle. Make sure locks inside the home are high enough so children cannot reach them and toddlers cannot slip outside on their own. According to kidsandcars.org, when we think of trunk entrapment we should consider both unintentional and intentional entrapment. Unintentional entrapment occurs when children decide to play an innocent game of hide and seek and think about hiding in the trunk of the car. They don’t understand how dangerous this is and how quickly temperatures rise inside a vehicle. Children may also play in the trunk while parents are looking for items in there or while parents are doing repairs on the vehicle. They unintentionally get trapped and don’t know how to get out. These incidents typically occur in the summer, so now is the time for education! Intentional entrapments occur as part of a robbery, carjacking, or child abduction. Since 2002, thanks to the hard work of kidsandcars.org, all trunks come equipped with a glow-in-the-dark trunk release installed. If you have an older model car, you can purchase one of these for a very nominal fee. We must teach our children about the dangers of playing near or in the trunk of a vehicle and if trapped, how they can get out. Teach kids NOT to play in or around cars. Always lock car doors and trunks and keep keys out of children’s sight and reach. Supervise young children closely around cars. Be especially careful when loading and unloading the trunk. Keep rear-fold down seats closed to prevent kids from getting into the trunk from inside the car. Arm your children with the facts. Practice escape techniques the same way you would hold a fire drill. If your child is put into the trunk, make sure they know how to pull out the tail light wires. Instruct them to kick out the brake light fixture and signal for help with their hand through the broken brake light fixture. If the police stop the car, bang on the trunk and scream. On average, 37 children die every year from heat-related deaths after being trapped in vehicles. Unfortunately, this happened just in the past week to three children. Our days are busy… we are in a rush getting to work or getting chores done. We are dropping off children at daycare, going grocery shopping or returning an item at the mall. If there is the slightest break in the daily routine, there is an increased chance that a child may be missed in the backseat. This can happen to ANYONE. In an overwhelming majority of child vehicular heatstroke deaths it was a loving, responsible parent that unknowingly left their child. The inside of the car heats very quickly. Even with windows cracked, temperatures can reach 125 degrees in just a few minutes. Children have died from heatstroke in cars in temps as low as 60 degrees. Kidsandcars.org believes the solution to these preventable tragedies is a combination of education and technology. They are tirelessly working on ways to educate parents and caregivers. Look before you lock – Get into the habit of opening the back door to check the back seat before leaving your vehicle. Put a reminder to check the back seat – Place your phone, handbag or briefcase in the backseat so you have to open the door to retrieve it every time you park. Keep a large stuffed animal in the child’s car seat – When the child is in the seat, place the animal in the front passenger seat. This creates a visual reminder. Make sure there is a policy with daycare – Should your child not show up as scheduled and they haven’t received a call from the parent, the daycare should contact you to ensure the safety of your child. NEVER leave your child knowingly in the car – Not even for a minute! If you see a child alone in a vehicle, get involved – Call 911 immediately. If the child seems hot or sick, get them out as quickly as possible. Be especially careful when routines change – Many tragedies occur during busy times, schedule changes and periods of crisis or holidays. Use drive-thru services when available – Make use of the drive-thru at banks, pharmacies, and dry cleaners, and pay for gas at the pump. For most of us, cars are a necessity, but we must put in place mechanisms to ensure the safety of our children. For more info, see KidsAndCars.org.